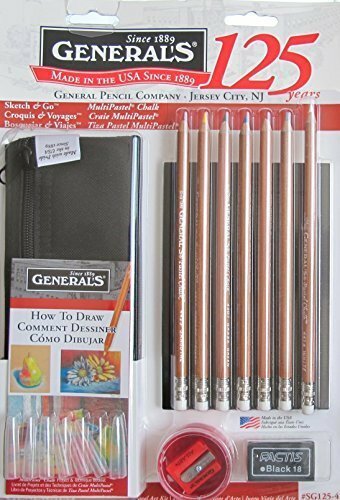 General's Sketch & Go Multi Pastel Chalk Drawing Set is a 2014 General's Pencil Company production, made in USA. ;INCLUDES: 7 Multi-Pastel Chalk Pencils (Various Earth Tones), 1 Little-Red All-Art Artist Pencil Sharpener, 1 Artist Eraser, 1 Drawing Journal, 1 Pencil Bag Case w Zipper Closure, 7 Clear Point Protectors, & a Project & Technique Booklet (3 Projects for YOU to Learn to Draw). ;For Ages 14+ Years. Learn to Draw w 3 Step-by-Step Projects by Artist Sean Dye, MFA! Learn Traditional Shading Techniques! ;GREAT for Travel, Nature Hikes, Plein Air Drawing or Whatever Preferred. All sizes, colors & details are provided to the best of my ability & may not be exact & may vary. ;*Package ONLY has some edge wear & small tear at top hanger. For Package Condition see CONDITION NOTE or Email Seller for Details. All sizes are approximate & may vary.